Pity the poor private eye (or official investigator, for that matter), who has to solve a case which may involve death by black magic, evidence that may have been altered or planted by an itinerant sorcerer, and supernatural entities ranging from ghosts to vampires to dragons. Even when the detective is a master of sorcery himself, the dragon may have an unbreakable alibi. 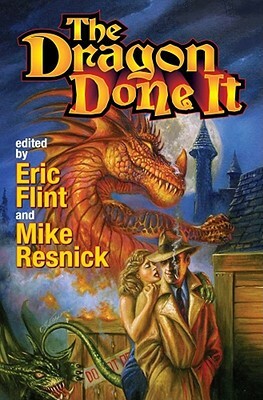 Best-selling authors Eric Flint and Mike Resnick present a generous selection of stories from the intersection of mystery and magic by popular writers Neil Gaiman, Gene Wolf, David Drake, Harry Turtledove, Esther M. Friesner, and more, including Flint and Resnick themselves. The Dragon Done It is an exciting cross-genre volume that both mystery fans and fantasy fans will enjoy. And so will dragons.